I want to say that we had a fantastic summer of inshore fishing here on Amelia Island. 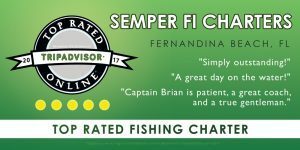 We had experienced anglers and novice anglers alike get in on the action. There were some great catches brought to the boat. Anglers brought in tarpon, bull redfish, jack crevalle, sharks, speckled trout, flounder, slot redfish. I had a regular customer land her very first tarpon. We were fishing the jetties, with live pogies when all of a sudden, the rod bent over and the line began to scream off the reel. She grabbed the rod and this big silver fish jumped out of the water. I hollered tarpon on and she let out a yell. Her husband and I had to get the other lines in so the fish would not get all tangled. The fish jumped several more times and then made a beeline for the rocks, my client worked hard to keep that fish from getting there. What seemed like forever, we finally got the fish to the side of the boat. After a couple of pictures, the tarpon was released and it swam off to fight another day. I especially enjoyed the kids I had on the boat over the summer. To see the smiles on their face when they are reeling in that first fish. There were several kids that received a certificate for various catches this year. This program is the Catch a Florida Memory. They have Big fish awards and also Slam awards. 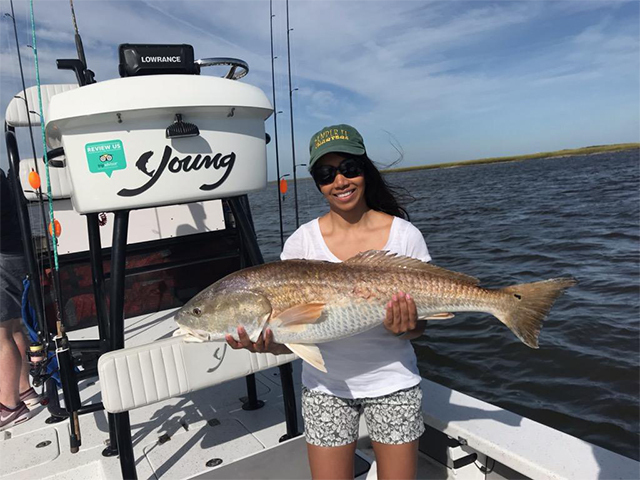 One of the hardest slams to get is a redfish, trout, and flounder which have to be caught on the same trip. I had the pleasure of submitting six slams this year for customers. Two of these came from an eight-year-old and a 10-year-old. I remember the eight-year-old, we were fishing with live shrimp on a cork around some docks. His mom and dad and sister were fishing too. Everyone was catching fish, when he caught one he would not say anything, its like he did this all the time. The first fish he landed was a really nice flounder. It was not long and he was reeling in a redfish, again he did not get overly excited. At this point, I mentioned that all he needed was a speckled trout. 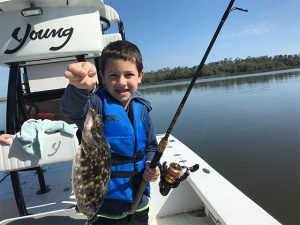 His mom and dad and sister too were catching some very nice speckled trout and I thought it would not be long before he got that trout for his slam. I saw his cork go down and he did a great job of landing another good redfish. He missed a few fish but was hanging in there. Of course, at this point me and mom were getting pretty excited. Well the cork went under and he set the hook and the fish was on. 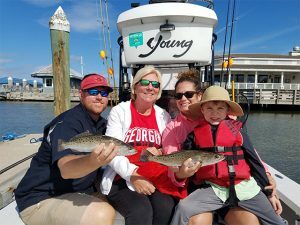 The way the fish was fighting I thought he had another redfish on the line when I saw the fish roll on the surface and low and behold it was a fantastic 22-inch speckled trout. We got the fish in the net and the slam was complete. High fives all around.